The end of 2013 will soon be upon us and the time is therefore right to finish off the calendar year with a couple of items that look back on some of the features that ran on Invisible Bordeaux over the past twelve months. This first set compiles the five most-read articles. Feel free to click on the titles or associated pictures to read the items! In spite of the fact that there are still no Starbucks coffee shops in Bordeaux (although this will change in early 2014), in recent years much of the city has inevitably become a standardised succession of the brand names that are ever-present on high streets throughout France and around the world. But in amongst the Apples and Oranges, Fnacs, Etams, Body Shops and Subways, a number of timelessly independent outlets continue to hold out against the onslaught! Scroll on down as we view a handful of examples of the kinds of elegant and charming shop fronts that can still be seen throughout the city. Let’s enjoy them while we can! Our first stop is stamp collectors' haunt Art et Philatélie, on the corner of Rue de la Porte-Dijeaux and Place Puy-Paulin. One of the most illustrious of Bordeaux’s daughters is Rosa Bonheur who, throughout her life which spanned much of the 19th century, became a world-renowned "animalière" and is regarded by many as the most famous female painter of her time. 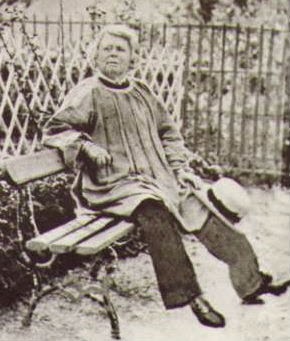 Rosa Bonheur was born Marie Rosalie Bonheur on March 16th 1822 at 29, Rue Saint-Jean-Saint-Seurin (now 55, Rue Duranteau) in Bordeaux. Her father, Oscar-Raymond Bonheur, was a landscape and portrait painter and frequented Spanish artist Francisco Goya during the four years the latter spent in Bordeaux up until his death. The artistic genes also ran on the side of her mother, Sophie, who was a piano teacher. Rosa struggled at school and her mother taught her to write, encouraging her to draw animals to illustrate each letter of the alphabet. Basics in art were also passed down by Oscar-Raymond to Rosa and the other, younger Bonheur siblings: Auguste and Juliette went on to become animal painters and Isidore Jules became an animal sculptor. 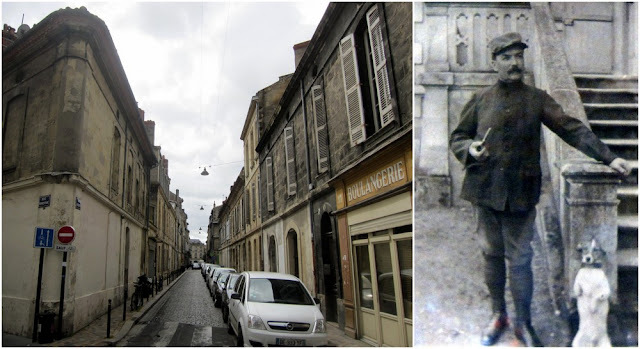 55, Rue Duranteau, the birthplace of Rosa Bonheur. In 1829, the family relocated to Paris. 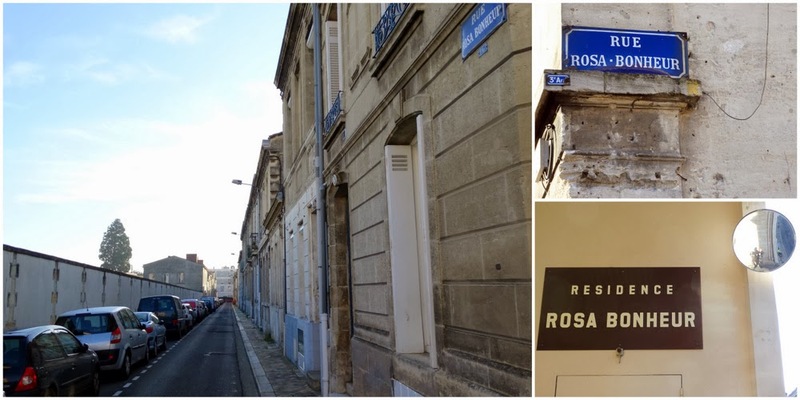 Four years later Rosa’s mother died and, soon afterwards, her father and his new partner set up in the Plaine Monceau district of Paris. Rosa instantly turned to painting and sculpture to help her through her teenage years. She began by copying images from drawing books and by sketching from plaster models. Then she began to make studies of domesticated animals from life. These included horses, sheep, cows, goats, rabbits and other animals observed in the pastures on the outskirts of Paris. 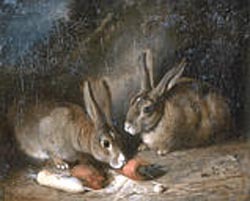 In 1840, her father allowed her to exhibit of picture of two rabbits at the “Salon de Paris”. 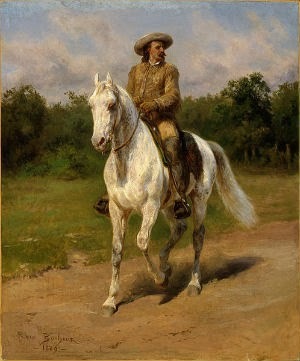 This was followed by a painting entitled “Cheval à vendre” which proved popular with audiences; its success encouraged Rosa Bonheur to officially trade as an “animalière”. In order to continually progress, she visited cattle markets and studied animal anatomy and osteology by visiting the abattoirs of Paris and by performing dissections of animals at the École nationale vétérinaire d'Alfort, the National Veterinary Institute in Paris. The homework paid off, resulting in her two most famous works: the 1848 "Ploughing in the Nivernais" (Le labourage Nivernais), which can now be seen at Musée d’Orsay in Paris, and the 1852 "The Horse Fair" (Le marché aux chevaux), a monumental piece which is now displayed by the Metropolitan Museum of Art, New York and which led to international fame, most notably in the US where her paintings became a staple of travelling exhibitions. Britain’s Queen Victoria was among her admirers, and the two met when Bonheur was en route for an extensive stay in Scotland in 1856. Bonheur’s status was further cemented in in 1865 she became the first female artist to be decorated with the Legion of Honour by the Empress Eugenie. "Le labourage nivernais". Source: Wikipedia. "Le marché aux chevaux". Source: Wikipedia. By now Rosa Bonheur, along with childhood friend Nathalie Micas, with whom she was to live for forty years, moved from Paris to the Château de By, a mansion house in Thomery, 75 kilometres to the south of the French capital (and which is now a permanent Rosa Bonheur museum). This is where she would spend the remainder of her life, painting the animals that surrounded her, and some famous human beings too: Colonel Cody, better-known as Buffalo Bill, made the round-trip to the Château de By to meet the celebrated painter while in Paris for the 1889 Universal Exhibition. Buffalo Bill’s visit came shortly after the death of Nathalie Micas. Bonheur soon welcomed a new tenant to her Château, the young American painter Anna Klumpke, who went on to pen Rosa’s “autobiography” and became heir to her worldly possessions after the animalière’s death in 1899. As well as her artistic achievements, Rosa Bonheur is regarded as having been staunchly independent and is remembered for the men’s clothes she would wear, her unorthodox (for the time) choice of companions and her penchant for chain-smoking cigars. On her wearing of trousers, Rosa stated that the choice was simply practical as it facilitated her work with animals. 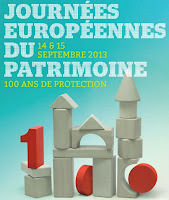 The authorities rubberstamped the choice, issuing a permit (a “permission de travestissement”) allowing her to wear trousers so that she could attend cattle fairs. 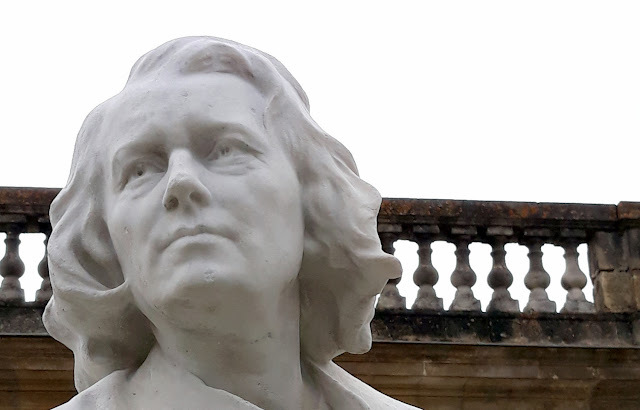 The Gaston Veuvenot Leroux sculpture of Rosa Bonheur in the Jardin Public, which was totally restored in 2018. 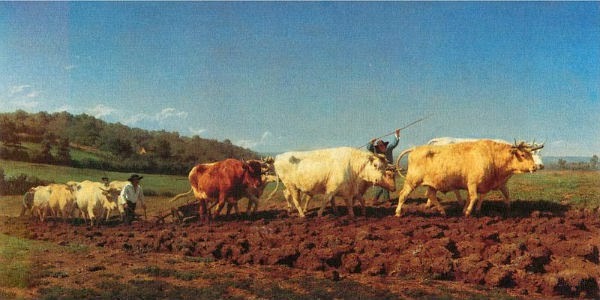 Even though Bordeaux only formed the backdrop to the early years of Rosa Bonheur’s life, a strong connection remains. 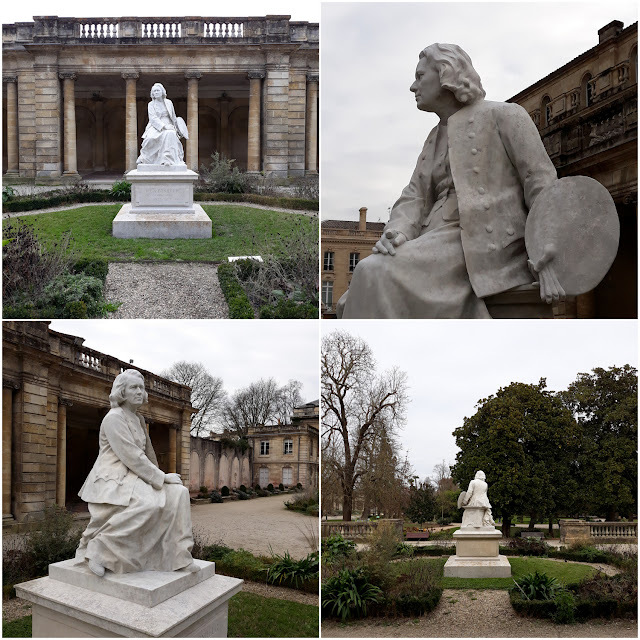 Since 1910, a sculpture of Bonheur by artist Gaston Veuvenot Leroux has been a permanent fixture in the Jardin Public. A street bears Rosa Bonheur’s name in the neighbourhood where she was born and in 2009 a discreet plaque was added to the house where she was born. The latest homage is to be found in the suburb of Bruges where the secondary school has been given her name. Staying in Bordeaux, one of Rosa Bonheur's most notable works can be seen at the Musée des Beaux-Arts (undergoing renovation work at the time of writing): the rather large (6.5 metres by 3 metres!) “Foulaison du blé en Camargue”. But, for now at least, Bordeaux has yet to follow in the footsteps of Elkridge, Maryland, where Rosa Bonheur Memorial Park is in fact a pet cemetery! 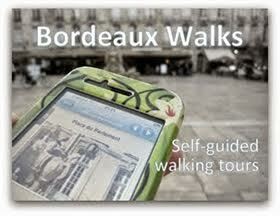 > Find them on the Invisible Bordeaux map: 55, Rue Duranteau (birthplace), Jardin Public (statue), Rue Rosa-Bonheur, Bordeaux; Collège Rosa-Bonheur, 57 Rue Jean Claudeville, Bruges. 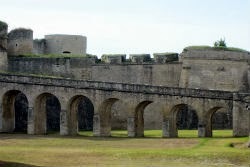 After creating an “Essential Bordeaux” page a few months ago, I have now produced an “Essential Gironde” page, which provides a thumbnail guide to the top daytrip-friendly sights to take in during a stay in or around Bordeaux. These include Arcachon, the Dune de Pilat, Saint-Émilion, Blaye citadel, the Médoc wine route and a handful of other “essential” visits. The page may be further edited in time when I think of things I may have initially forgotten about or if I receive too many messages from readers complaining that I’ve left a specific sight off the list! 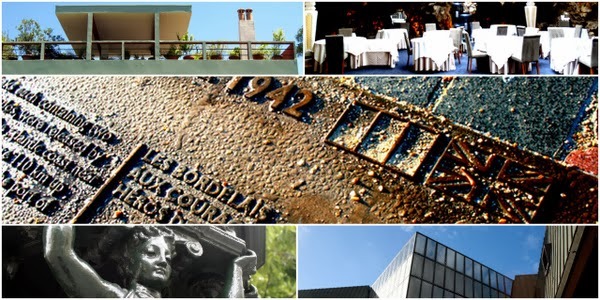 The Essential Gironde page will remain permanently accessible in the top horizontal menu and all the sights which have been singled out can be easily located thanks to the dedicated Googlemap - which also comprises the essential sights to enjoy in Bordeaux itself. Click here for the Invisible Bordeaux guide to the Gironde essentials, and here for the Bordeaux essentials. Photos by fellow Bonjour Bordeaux contributors Yves Maguin, Amandine Maurand and myself are currently on display at the Tapa’l’Oeil bar in the Sainte-Croix district of Bordeaux. 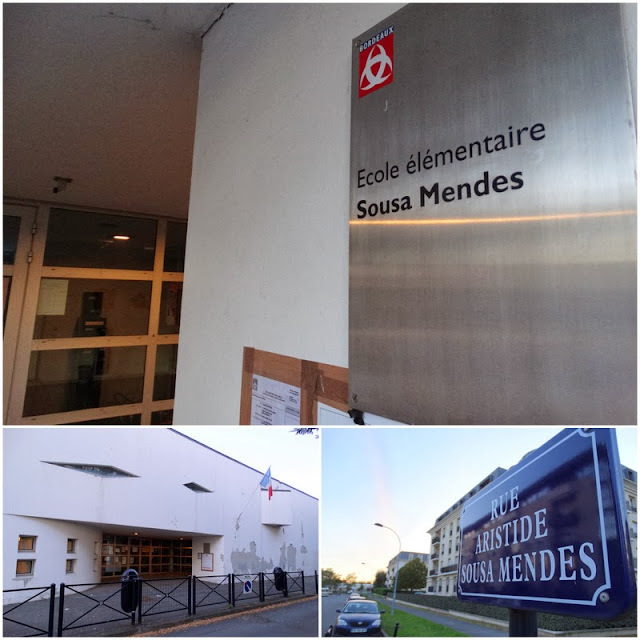 The pictures were taken over the course of a single late-summer morning in the Saint-Genès, Nansouty and Saint-Michel districts of Bordeaux, and were initially exhibited as part of the district Mairie’s Arty Garden Party back in September. 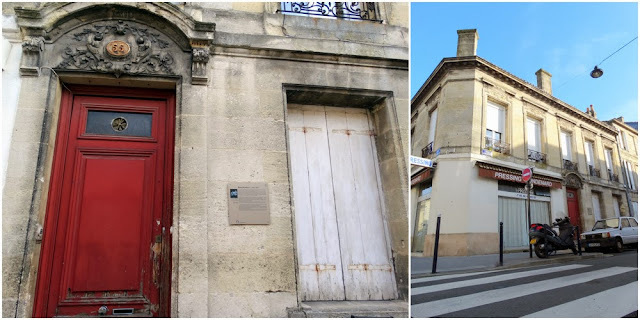 The photos take in architecture, infrastructure, little-noticed details on buildings and scenes of everyday life (a previous blog item has already compiled the Invisible Bordeaux contributions to the full exhibition). The photos will be on display until Saturday December 14th 2013. Naturally, admission is entirely free of charge, while the good people of Tapa’l’Oeil will gladly provide quality food and drink at affordable prices! 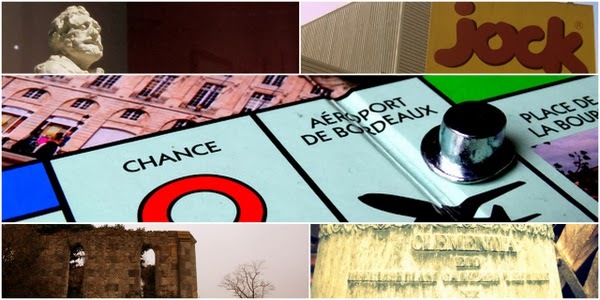 In the previous Invisible Bordeaux posts (click here for part 1 and part 2), you will have read about the first stages in my attempt to use the Bordeaux edition of the board game Monopoly as a roadmap to cycle around the city. The second chapter ended with me outside Sainte-Croix church. From here it was just a short ride to Gare Saint-Jean railway station, one of the four public transport squares to collect on the Bordeaux Monopoly board (solely railway stations in the original editions). On the other side of the railway lines lies the Belcier quarter which is, along with Bassins à Flots, currently the cheapest square on the board (60 Monopoly dollars, or M's). There are run-down, semi-demolished houses, rows of no-frills low-rise échoppes, but also a number of modern office and residential buildings taking shape and heralding the area’s on-going re-birth, which is likely to move up a gear when the very high-speed rail network is complete in 2017. Property here will then be just two hours from central Paris, i.e. almost as accessible as some of the capital city’s distant suburbs! In the previous Invisible Bordeaux post, you will have read about the first stages in my attempt to use the Bordeaux edition of Monopoly as a roadmap to cycle around the city. The first chapter ended with me on Esplanade des Quinconces admiring wedding photographers at work. From here on the Monopoly stops were coming thick and fast: the affluent Triangle d’Or (the most expensive blue-set property on the board, at 400 Monopoly dollars, or M's), the public transport hub and square that is Place Gambetta (M240), the wide walkway of Cours du Chapeau-Rouge (M260) where a few artists were displaying and selling their pictures, and Place de la Bourse (M320) which, at the time I was there, was still virtually deserted. Every year during my family’s summer holidays, a different board game rules the early-evening apéritif slot. This year, that game was the Bordeaux edition of the classic board game Monopoly and it occurred to me, possibly after a couple of glasses of Corsican wine (and probably inspired by this book), that the board could serve as an interesting and unusual roadmap for a cycle ride around the city. The Invisible Bordeaux Monopoly challenge was born! The current Bordeaux Monopoly set, one of a host of regional variants that are now available (Bassin d’Arcachon and Gironde versions also exist), was released by games specialists Winning Moves under licence from Hasbro in 2011, a decade on from the city’s first edition. The streets and districts on the board cover a wide variety of property market values, as identified with the aid of local real estate specialists. The Monopoly board therefore serves as an instant snapshot of where in the city property is the most desirable, and where it is the most affordable! Welcome to the Le Chapon Fin, one of Bordeaux’s oldest restaurants and firmly established as an essential high-society meeting point in the heart of the affluent Triangle d’Or, the three sides of which are formed by Cours de l’Intendance, Cours Clémenceau and Allées de Tourny. The restaurant was founded in 1825 in the slipstream of the French Revolution. Convent land and buildings had been confiscated and within the space of a few years of hasty urban planning, housing, shops, theatres, a covered market and restaurants all mushroomed to serve the needs of the quarter’s wealthy trader residents. An exhibition held last weekend as part of the Saint-Michel/Nansouty/Saint-Michel quarter's Arty Garden Party featured a number of my photos. Fellow snapper Amandine Maurand and I had been commissioned by Bonjour Bordeaux supremo Yves Maguin to team up with him to take photographs in the surrounding neighbourhood. Some 60 of our shots were on display at the event, which was held in the rather lovely Jardin des Dames de la Foi. 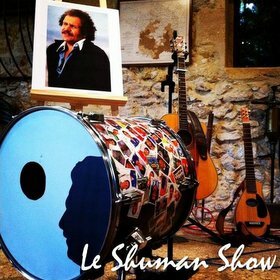 As an integral part of the programme - which also featured concerts, drama productions, guided walking tours, children's workshops, yoga sessions and martial arts demos - the exhibition proved to be popular and district mayor Fabien Robert even stated that the photos uncovered a number of sights with which he was unfamiliar. 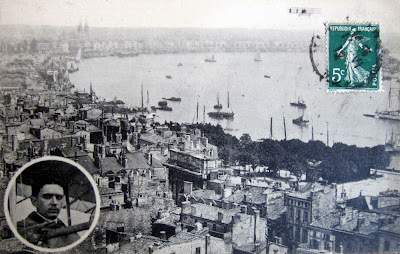 It is September 3rd 1910, and the silhouette which can be seen over to the top right of the picture above, flying over the Garonne in central Bordeaux, is that of a Voisin-Gnome biplane, with the Peruvian aviator Juan Bielovucic on board (inset). 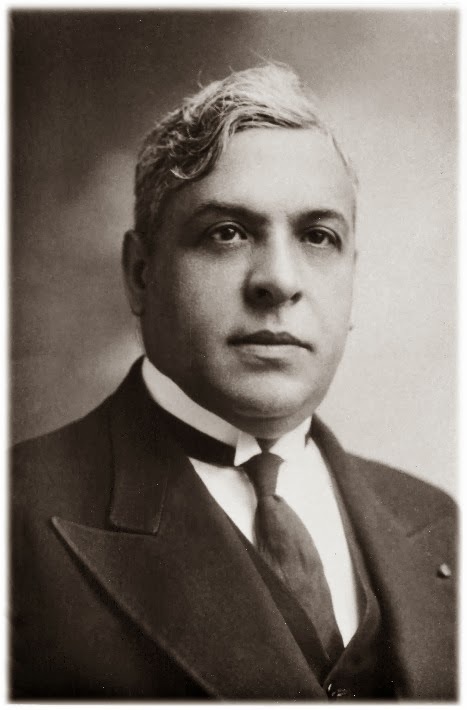 His arrival in the city came ahead of a week-long “Grande semaine d’aviation”, which laid the foundations of the longstanding and healthy relationship between the Bordeaux area and aeronautics… and was in many ways the birth of Mérignac airport. 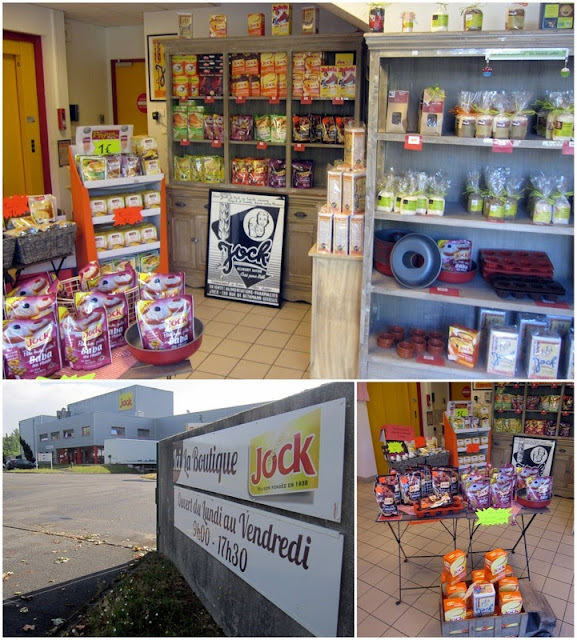 On the right bank of the Garonne river, mid-way between Pont Chaban-Delmas and Pont d’Aquitaine, the 70-strong workforce of an industrial plant is hard at work around the clock manufacturing products under the brand name Jock. The name is familiar to the citizens of Bordeaux and beyond, and the company is responsible for what is, for many, one of the most evocative foodstuffs of their childhood: “la crème Jock”. 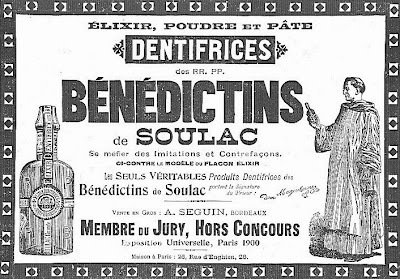 The delicacy was created by biscuit-maker Raymond Boulesque in 1938 on Rue Bergeret in the central Bordeaux Capucins district. His aim had been to invent an inexpensive cereal-based foodstuff for children at a time when sugar was both hard to come by and costly. The end-product proved just as popular with adults, who enjoyed the crème as a dessert in its own right. After the Second World War, Boulesque made a first attempt at diversifying into other products, developing a hot chocolate breakfast treat which was given the name Mars. He had been unaware of the identically-named chocolate bar which had been developed and produced in the UK since 1932. The Bordeaux version of Mars was soon dropped although the no doubt closely-related “Crème tradition au chocolat” is still available today and referred to on the company’s website as the “younger sister” of Boulesque’s original invention. The venture went from strength to strength though and in 1955, under the leadership of the founder’s son Marius Boulesque, the Jock workforce moved to new premises on Rue de Bethmann, to the south-west of the city. That period, and the following phase, with a third-generation member of the family at the helm, Jean-Pierre Ballanger, was the start of the golden age of la crème Jock, which is still nostalgically associated by countless people with their childhood. and the scene at n°130 Rue de Bethmann today. In 1999, Jock moved to the new purpose-built facility on Quai de Brazza where they can still be found today, and the current managers are Jean-Pierre and Jean-Philippe Ballanger, the great-grandsons of Raymond Boulesque. The diversification strategy which began all those years ago is paying dividends; the original crème now accounts for less than 5% of the company’s sales while its most bankable products include instant cake batter (their brownie recipe is a hit in the US) and other readymade dessert mixtures (some of which are marketed under the PrePat'33/PréPât brand). The company also manufactures countless products incognito. These are then sold under the brand names of chain stores such as Leclerc, Super U and Carrefour (output extends to icing sugar and yeast). Jock now aim to launch at least three new products every year and continue boosting revenues, which recently recorded a five-fold jump over an eleven-year period, hitting the €30m mark in 2012. Since 2012, the full range of Jock products has been available for purchase in a quaint factory shop located on the ground floor of the facility and open during factory hours. The shop also stocks vintage branded souvenirs and cooking utensils, as well as prominent reminders of the company’s partnership deal with local Top 14 rugby team, Union Bordeaux-Bègles (their logo features on the outfits the players wear when warming up and the club's official rugby balls). 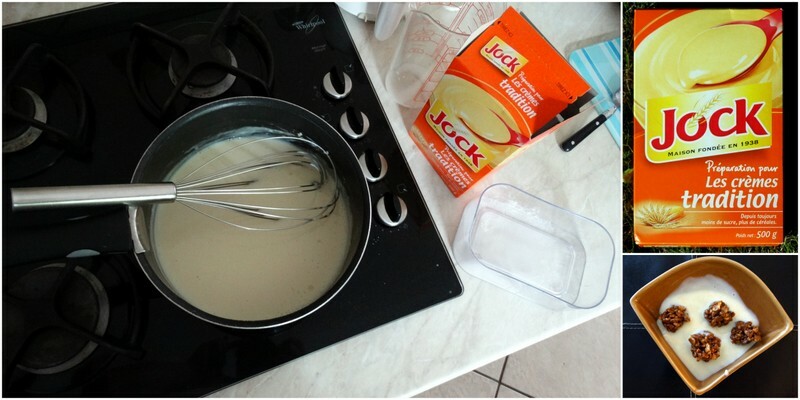 First up was the crème Jock itself, and it soon transpired that it had been a good move to purchase two packs as I misread the slightly ambiguous instructions and ended up emptying the first pack, thus putting ten times too much powder into my pan of milk. The result proved inedible although I was able to use it to plaster over some unsightly holes in the bedroom of one of my children. The second time round I paid far more attention to the recipe (confusingly, the recommended quantities are detailed in a separate box on the pack to the cooking instructions themselves) and opted for “crème anglaise” texture. Indeed, one of the beauties of crème Jock is that differing thicknesses genuinely do result in totally different desserts (such as crème dessert and crème pâtissière). This take on crème anglaise, which was slightly less sweet than other products on the market, did prove successful and was used for a dessert made up of Rice Krispies hardened with, ironically, melted down Mars bars. It was rather delicious. What is more, after a further 24 hours in the fridge, the crème had hardened and was enjoyed the following day as a standalone dessert. My second failed experiment involved the Jock cannelés. Cooking cannelés is a fine art and on that day I ran out of time. The recommended baking time was between 40 and 45 minutes and well beyond that deadline the cannelés were still not cooked on the inside, or golden brown on the outside. Perhaps this was down to the silicon baking moulds I was using (which should not have been issue). Whatever, I grew impatient and we ended up consuming the half-baked cannelés, all photographic evidence of which has been destroyed. To end on a positive note though, my attempt at cooking the readymade lemon cake mixture was a resounding success. With the benefit of hindsight, the most difficult part of the whole process was opening the packet… then resisting the temptation to eat the raw mixture inside. 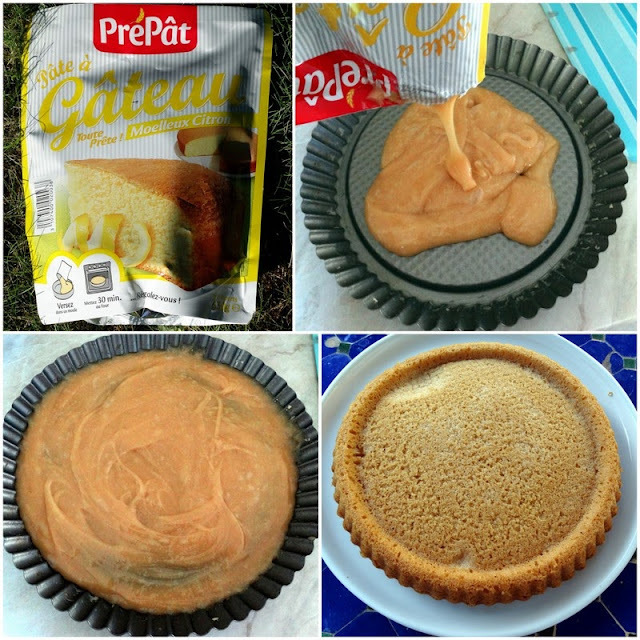 Other than greasing the tin, no additional ingredients are required and once in the oven the cake bakes and rises within 30 minutes. The resulting cake was an absolute delight and, it might be noted, remarkably easy to slice. If I’m to further develop my nascent love affair with Jock produce, I still have quite a bit of catching up to do though. A quick web search will result in a whole host of more creative recipe ideas posted by enthusiasts, the best source being the blog run by Jock themselves! > Find them on the Invisible Bordeaux map: factory and shop, Quai de Brazza; previous locations on Rue Bergeret and Rue de Bethmann. Click here if video doesn't display properly on your device. Big thanks to Guillaume and Erik who suggested this subject!